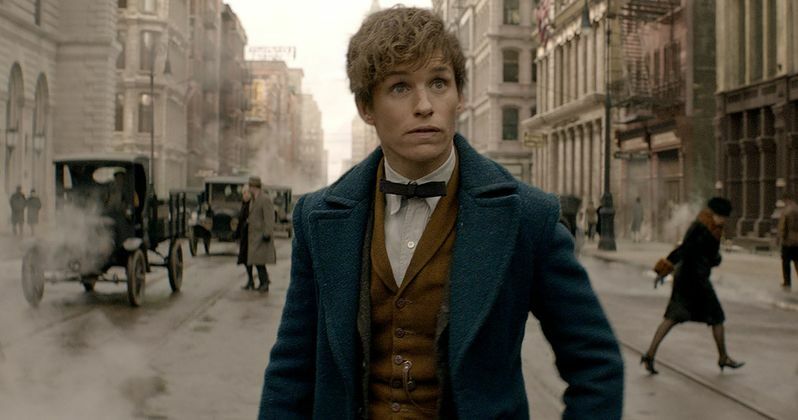 It's been more than two months since we last saw any footage from the Harry Potter prequel Fantastic Beasts and Where to Find Them, but thankfully we have a new look at this long-awaited adventure. Star Eddie Redmayne, who plays Newt Scamander, put in an appearance at the MTV Movie Awards earlier tonight, where he showcased never-before-seen part of the wizarding world created by J.K. Rowling. Warner Bros. Pictures has slated Fantastic Beasts and Where to Find Them for worldwide release in 2D and 3D in select theaters and IMAX on November 18, 2016. Academy Award winner Eddie Redmayne (The Theory of Everything) stars in the central role of wizarding world magizoologist Newt Scamander, under the direction of David Yates, who helmed the last four Harry Potter blockbusters. Fantastic Beasts and Where to Find Them opens in 1926 as Newt Scamander has just completed a global excursion to find and document an extraordinary array of magical creatures. Arriving in New York for a brief stopover, he might have come and gone without incident... were it not for a No-Maj (American for Muggle) named Jacob, a misplaced magical case, and the escape of some of Newt's fantastic beasts, which could spell trouble for both the wizarding and No-Maj worlds. The cast of Fantastic Beasts and Where to Find Them is rounded out by Katherine Waterston (Steve Jobs, Inherent Vice) as Tina; Tony Award winner Dan Fogler (The 25th Annual Putnam County Spelling Bee) as Jacob; Alison Sudol (Dig, Transparent) as Tina's sister, Queenie; Ezra Miller (Trainwreck) as Credence; two-time Oscar nominee Samantha Morton (In America, Sweet and Lowdown) as Mary Lou; Oscar winner Jon Voight (Coming Home, TV's Ray Donovan) as Henry Shaw, Sr.; Ron Perlman (the Hellboy films) as Gnarlack; Carmen Ejogo (Selma) as Seraphina; Jenn Murray (Brooklyn) as Chastity; young newcomer Faith Wood-Blagrove as Modesty; and Colin Farrell (True Detective) as Percival Graves. The film marks the screenwriting debut of J.K. Rowling, whose beloved Harry Potter books were adapted into the top-grossing film franchise of all time. Her script was inspired by the Hogwarts textbook Fantastic Beasts and Where to Find Them, written by her character Newt Scamander. The film reunites a number of people from the Harry Potter features, including producers David Heyman, J.K. Rowling, Steve Kloves and Lionel Wigram. Fantastic Beasts and Where to Find Them was filmed at Warner Bros. Studios Leavesden, which was home to the Harry Potter films for a decade. Some scenes were also shot on location in Liverpool, England. Take a look at the latest footage for Fantastic Beasts and Where to Find Them, and stay tuned for more footage and photos as we inch closer and closer to its release next November.